Cable cars set for Nigeria’s largest city? If assertions over the past few weeks are anything to go by, cable cars would be crisscrossing some parts of Lagos in two years’ time. 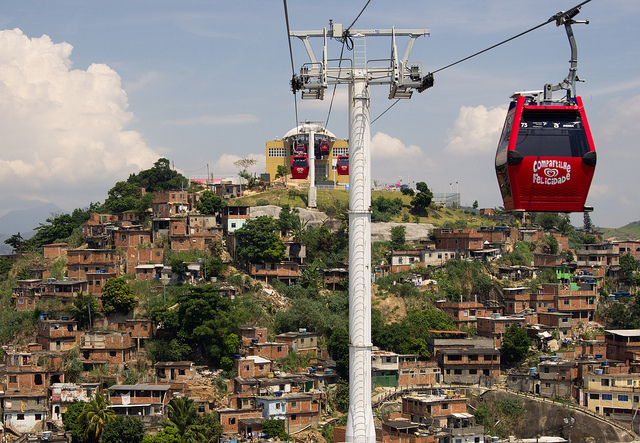 A company called Ropeways Transport is investing $500 million (about N81 billion) to launch a cable car mass urban transit system in one of the most populous cities in the world. Ropeways has signed a 30-year franchise agreement with the Lagos Metropolitan Area Transport Authority (LAMATA) and the Lagos State Government for the execution of the project. Some of the locations to be covered include Apapa, Victoria Island, Obalende and Falomo. The project is expected to be fully completed and commissioned by early 2015. Aside from the economic whupping of 2008–2009, a major casualty of the recession was space itself. Homeowners and businesses bled square footage, leaving behind a landscape of empty McMansions, vacated big-box stores, and now-famously abandoned shopping malls. Existing mall mashups pretty much stick to the public realm—like Cleveland’s indoor gardens and Vanderbilt’s health clinics—but this spring a shuttered shopping center in downtown Providence will be reborn in micro form, with two stories of micro-apartments above ground-floor micro-retail. The MyCiTi service in Cape Town has surpassed five million passenger trips, since the first buses for the 2010 FIFAWorld Cup were launched, the city said. It said up to the end of December 2012, a total number of 5,374,508 passengers were recorded. Of this total, over 4.5 million passengers have made use of the airport route, the Table View trunk route, as well as the area routes in the city centre and the Table View area since the system’s launch in May 2011. At the Old Capitol Pump House, a restored building along the Anacostia River, Washington, D.C. Mayor Vincent Grey announced the launch of the long-awaited Sustainable D.C. plan. The result of an amazing public outreach process that involved over 400 local green experts, more than 180 public meetings in front of 5,000 people, and 15 D.C. government departments and agencies, the plan is an attempt to make “D.C. the greenest, healthiest, and most livable city in the U.S.” by 2032. On rail tracks in Atbara, Sudan’s main railway city, stray engines and empty coaches from trains built in Europe, India and the United States, some more than 50 years ago, stand still in the scorching heat. Today, after decades of mismanagement and neglect, most of the country’s rail track is out of service. But the government, with the help of Chinese money and expertise, wants to rebuild it and restore some of the industry’s former glory. Several hours of heavy rain and a thunderstorm in the Greek capital Athens have flooded roads and homes, caused traffic jams and disrupted the train and tram network, officials say. The deluge inundated basements and forced authorities to close underpasses and a central subway station. The Walvis Bay Municipality commissioned an N$180 000 waste collection system, known as the Molok deep collection system as one of its eco-friendly initiatives. Four Molok systems are already operational at the town and 19 more will be installed in due course. One Molok system will replace up to 40 bins at the town and will be installed at strategic places that produce most waste at the town such as hotels, retail shops and apartment blocks. Since military intervention began over a month ago in northern Mali, the city of Gao has been cut off from major markets, leading to shortages of basic goods, skyrocketing food prices and a reliance on the International Committee of the Red Cross (ICRC) to provide water and electricity. Two days ago the road from central Mali’s Mopti reopened, giving hope to residents that the situation might ease. Urbanist-in-training from Cape Town, currently working in London. MSc City Design & Social Science. Tagged: atbara athens cape town gao lagos providence the cities this week walvis bay washington d.c.